“Deeply felt, deftly rendered, stunningly informative and often enraging” (Publishers Weekly), Hooked appears as we are finally waking up to the inadequacies of our current drug-rehab policies. With court-mandated rehab being debated across the country, Shavelson’s in-depth look at the struggles of five addicts as they travel through the treatment maze makes a powerful case for reform. 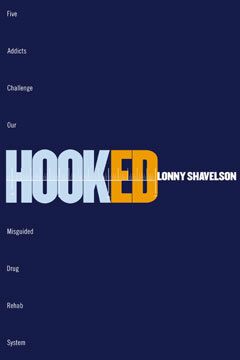 Highly readable and shaped by Shavelson’s experience as a journalist and physician, Hooked takes us through the anguishing “intake” and controversial House meetings, inside counselors’ and judges’ offices where many treatment decisions are made, and to prison cells where, under current policies, many addicts end up. It explores the links between drug addiction, mental illness, and trauma, including child abuse—links often ignored by current rehab efforts—and argues for an integrated approach that treats the roots of drug abuse, not just the behavior itself. Hailed as “compelling” and “heartbreaking” (Time Out), Hooked offers a provocative, honest look at the seemingly intractable issue of drug addiction, and offers powerful alternatives to our current policies.